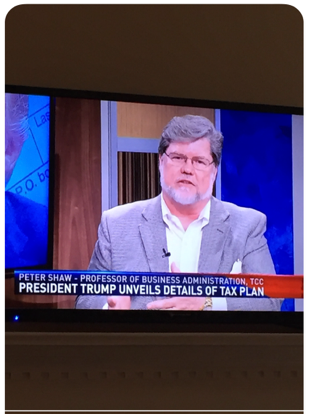 April 28, 2017 WVEC TV interview regarding President Trump's proposed tax plan. Professor Shaw WVEC TV interview regarding US Navy Two Carrier Purchase (January 1, 2018). Professor Shaw's Light Rail Proposed Extension (see video Formal Council Session April 5, 39.05 minute mark) remarks before Virginia Beach City Council . Professor Shaw's guest column (Sunday Forum section, page 21, Sunday Virginian Pilot, December 20): A path toward economic prosperity . Professor Shaw comments on the Towne Bank and Monarch Bank $7.3 billion dollar merger (Virginia Pilot, December 18, 2015). Virginian Pilot interview regarding regional unemployment rates and job growth or go to page 5 in the Virginian Pilot newspaper front section (Thursday, October 29, 2015). As a business professor, I agree with Miller’s argument for getting rid of tolls at several Hampton Roads projects and replacing them with a 0.7-cent increase in the state sales tax. In addition to the reasons Miller cites, the sales tax would be a better vehicle to track inflation in the revenue stream to pay for our badly needed highway infrastructure needs. After all, we already pay a state sales tax to help fund most transportation needs in Virginia. Miller cites the findings of Old Dominion University professor James V. Koch’s recent State of the Region report. I agree with Koch’s conclusions. Funding badly needed highway infrastructure is a key building block to expanding our regional economy. For the most part, regional and state sales tax revenue will be recycled back into the Virginia and Hampton Roads economies when it is spent on infrastructure. Toll revenue for the Midtown and Downtown tunnels will be spent on the tunnel and road operating costs, paying the bond holders (most of whom are not in this area) and the profits to the foreign company that manages the tunnels. Miller’s ideas make a lot of economic sense for our region. Professor Shaw Comments on the Possible Congressional Sequestration Budget and Economic Impact On The Region (September 1, 2015). Professor Shaw's Hampton Roads economic promotion concept presentation to WVEC TV top management and staff. (August 13, 2015). Professor Shaw comments on Governor's "GO Virginia" press conference with Phil Walzer, Virginia Pilot (July 29, 2015). Professor Shaw comments on Newport News Shipyard's 1,500 job layoffs with WVEC TV (July 23, 2015). Professor Shaw comments on the City of Portsmouth budget crisis and economic development challenges to Joanne Kimberlin, Virginian Pilot newspaper (May 10, 2015). Professor Shaw comments on Congress' refusal to issue BRAC review of area military bases to Mike Gooding, WVEC TV (May 6, 20015). Professor Shaw's interview with Mike Gooding (WVEC TV, April 13, 2015) regarding the proposed increase in the US Navy fleet and the economic impact on Hampton Roads. Professor Shaw's Virginian Pilot interview (March 20, 2015) regarding Hampton Roads Regional Unemployment Data . Professor Shaw interview regarding Hampton Roads' August 2014 unemployment performance with Phil Walzer,Virginian Pilot (October 2, 2014). Professor Shaw comments on the effects of federal government shutdown on 401K accounts (WVEC TV online article, October 1, 2013). Professor Shaw comments on the effects of federal government shutdown on Hampton Roads (WVEC TV September 23, 2013). Professor Shaw quoted in "Sequester a wake-up call for local business diversity? (March 18, 2013)"